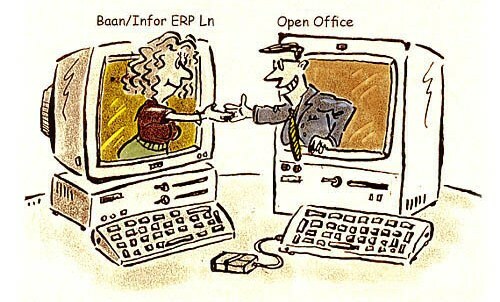 Do you wish to convert Baan/Infor ERP Ln reports to spreadsheets in Open Office? Or on a UNIX machine? Do you wish to run a cron job to reports in Excel format? NAZDAQ now support converting reports to Open Office and creating Excel sheets (xls or xlsx files) on any machine, including UNIX and Linux, and even in a cron job! The new features are now available in our products B2Email Plus (for interactive use) and B2Email Standard (for automatic use and jobs). "Pemeco gets Supply Chain and Baan. They provided our senior planning management and staff with an excellent Planning Seminar that was customized to our business needs and system setup. Our department will certainly improve its productivity and efficiency as a result. I would highly recommend this seminar to any company that's looking to improve planning and scheduling accuracy." Tikhvin Railway Car Building Plant (TVSZ, www.tvsz.ru) started to implement the information enterprise resource planning system ERP LN developed by the leading provider of integrated solutions for the enterprises of Infor. IPL Consulting was appointed as the project consultants. Implementing the advanced ERP-system at the construction stage will allow developing a modern effective Enterprise Resource Planning system as a whole at TVSZ, its divisions and associated organizations. Integrated system solution will ensure support of business processes via all divisions of a new car building plant, including production, sales, procurement, finance, inventory management, logistics and aftersales service, fully meeting the modern standards on engineering enterprise resource planning. MERINO SUCCESSFULLY INTEGRATES BAAN IVc4 WITH SAP FOR HITACHI METGLAS INDIA. Integration of Baan IV c4 with SAP enables Hitachi to have seamless flow of financial data. April, 2011 - Infor's largest partner for ERP LN/ Baan, Merino Services has announced successful completion of a challenging project of Integrating Baan IV c4 with SAP for Hitachi Metglas India. As per Hitachi's global standardization they had put SAP as a standard system for managing financials and Hitachi Metglas India had decided to integrate the current Baan IV c4 the current ERP system with SAP financials. Hitachi is using Baan IV c4 to support their Distribution, Manufacturing and with the completion of the project they have seamless flow of financial information / data from their Baan IV c4 to the SAP System. The project has ensured Hitachi 100% integration while respecting business rules and data security on both the systems. As an Infor ERP Baan/LN customer, you're invited to join us for the first Monthly ERP Baan/LN Hour. Merino Services to help Gold Square Sales deploy Infor ERP LN ,an application with single interface to efficiently manage and control operations, monitor, analyse and evaluate its 3 business entities. March , 2011 – Infor’s largest and most successful partner for ERP LN/ Baan, Merino Services , announces Gold Square Sales India Pvt Ltd has chosen Merino Services to deploy Infor ERP LN at their organization . The organization is market leader in Indian e-retailing. They have got 3 entities in the same business line which includes Fashion and You, Deals and You, Shoes and You. The project is expected to bring a single interface to efficiently manage and control operations, monitor, analyse and evaluate the group's 3 entities Fashion and You, Deals and You, Shoes and You, in same line of business of e - retailing. Through this implementation, the company is looking at achieving seamless Integration of online order booking with the finance module which involves huge volume of transactions. On the technical side, the company is looking at integrating other specific solutions like Infor Warehouse Management System and Infor Customer Relationship Management integrated with Infor ERP LN. Infor Webinars: Why LN? Why now? Think back to when you implemented Infor ERP Baan: Your business was a lot simpler then, wasn't it? With global business demands, rapidly changing processes, and rigid compliance rules, it's a lot harder to keep up today. What if you could meet new business challenges without re-engineering old software? With Infor ERP LN, you get the most up-to-date ERP technology that keeps you competitive in today’s market. With a customizable user experience, great integration to third parties, and the ability to run in real time, you'll get what you've been waiting for—without re-engineering. National Cables Industry improves Baan IV performance using Merino Services Off Site-Off shore methodology – Reduce cost of Project by 60%. February , 2010 – Infor’s largest partner for ERP LN/ Baan, Merino Services and its Middle East partner ITWARE LLC, Dubai (ITW) announced, National Cables Industry ( NCI) , UAE leading company in the field of Electrical cables has successfully archived their 8 years old Baan IV data using Merino Services Off site Off Shore methodology leading to reduction in cost of project by 60%. NCI have been using Baan IV from last 8 years and there was huge amount of critical data residing within the system that led to data overflow, longer transaction processing times, and performance degradation. They selected ITW- Merino Services to be their partner- 2- progress for data archiving with an expectation of a cost effective mechanism. Merino Services helps Allmineral to manage its various business processes with Infor ERP LN 6.1. February 5, 2010 - Merino Services, Infor's largest partner for ERP LN/ Baan announced, All mineral Asia Pvt Ltd. going live with ERP LN 6.1. The implementation was incubated with an objective to create an IT platform to bring transparency, control, efficiency and integration of business processes across the organization. Merino Services as a partner to progress has helped the company meet the key challenges they faced with different business functions from planning to subcontracting and handling the principal items in a single system. Allmineral has been able to obtain significant business benefits from accounting to reporting and achieved Information transparency across organization, operational excellence with reduced cost. About Allmineral Asia Pvt. Ltd.
FARNBOROUGH, UK – February 07, 2011 – Infor, a leading provider of business application software serving over 70,000 customers, today announced a global partnership with output and document management provider EFS technology. The partnership will extend the benefits of Infor ERP LN (and all versions of Baan) through offering Infor customers fully integrated, industry-leading document management capabilities, enhancing productivity and efficiency benefits whilst helping to cut costs and complexity. All times are GMT +2. The time now is 05:46.